Atlanta, GA, March 2, 2018: Having cast its magic over several international festivals ­­and garnering awards internationally, Kannada movie, Mojo, premiered in Atlanta on February 24 and 25 along with several states across the US including SFO, Dallas, Chicago, DC and New Jersey. Produced by California based entrepreneur Gajanan Bhat under the Poorvi Arts banner and directed by Sreesha Belakavaadi, Mojo carves its own niche in the regional cinema hemisphere, foraying into the realm of precognition, delving into the awakening of the subconscious mind of the protagonist that permeates through his dreams, intuition and premonitions, entrapping him in the strange unfolding of events leading to crime, murder, love, suspicion and enigma. Deriving its roots from the African Creole language, and Sanskrit, “Mojo”, means magic or miracle. The magic or mojo in the movie refers to magical powers of subconscious mind of the lead protagonist who has the power to see the future. Recipient of eight international film festival selections and four prestigious awards, Mojo’s magical spell at international film festivals began at its world premiere at FOG (Festival Of Globe) International Film Festival held at Fremont, CA, USA bagging an international award in the Best Regional Film category at its maiden screening. The magical run continued with the Best Experimental Film Award at Eurasia IFF, Best Experimental Film Award at GGIFF and Outstanding Achievement Award at Calcutta Cult IFF. 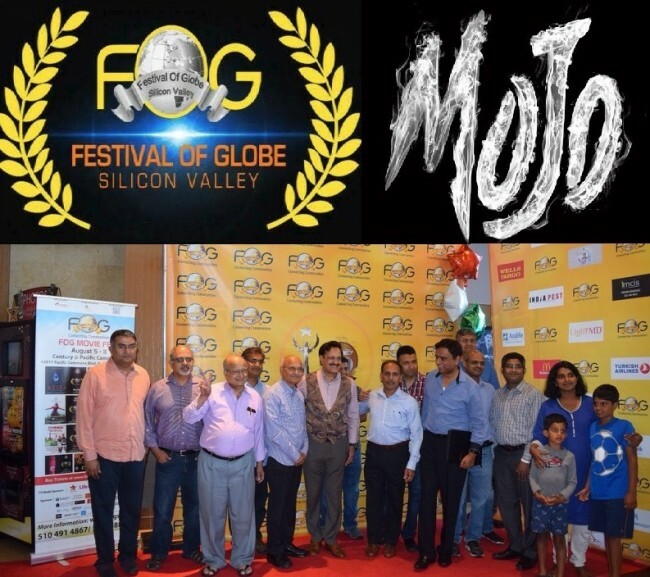 Mojo has been credited for its Official Selection at major international festivals including FIFF (Fog International Film Festival USA), GIFF (Glendale International Film Festival USA), LIFF (Los Angeles International Film Festival USA), (GGIFF) Golden Gate International Film Festival, USA and CICFF (Calcutta International Film Festival). A photo-journalist, Mohan, discovers to his horror and surprise that his premonitions turn out to be true. Matters take a turn for the worse when Mohan is ensnared in a murder involving a child whose name happens to be Mojo. Disturbed psychologically, Mohan seeks medical help and chances upon an old college friend Maya, a psychologist. Maya’s hypnotic prowess and therapeutic expertise in psychiatry forces Mohan to believe that everything he experienced and shared with Maya is an unfathomable subconscious play of hallucination, a world of illusions which Mohan has built without his conscious awareness and believed ignorantly. A shocked Mohan tries to recapitulate the dreadful murder he believes he was entrapped in but is unable to tell the difference between reality and his illusions. A fortune teller’s sinister spell, a subconscious spy who can be sensed only by Mohan’s premonitions, Mohan’s close friend and confidant all become potential suspects of the murder. Did the murder really happen? Is Mojo real or an illusion? An intriguing climax and the build-up leading to it connect the dots quite nicely. Mojo’s charm is a collective and cohesive collaboration of all contributing movie aspects including crisp editing by Rathan S Goruru, captivating cinematography by Ananth Urs, scintillating background score by by Ajaneesh Loknath and endearing music by S D Aravind, the strongest factor being Belakavaadi’s unique approach to storytelling and experimental characterizations. Take for example, the quotes of hymns from scriptures and literature such as Mandukya Upanishad, Chanayka Neeti – the hymns of Upanishads are used as a narrative to reveal the mindset of a spy character, while there is no direct communication between the character and the audience. For another character, a dialect that doesn’t exist is created. The director’s clever choice to pick fresh faces, Manu and Anoosha (who both have theatre background), for lead characters gives the audience a chance to go with the flow of the movie, not burdened with prior expectations from an established actor. Some nice touches including director Yogaraj Bhat’s voice for the movie’s prologue, intended to introduce the audience to the power of the subconscious mind enhance the cinematic experience. A serial California based entrepreneur as his LinkedIn profile describes him, Gajanan Bhat, the producer was introduced to director Belakavaadi through a common friend Satish Pathak, who is also a co-producer. “To me, movies should entertain people; entertainment could come in different ways; @MOJO, we wanted to illustrate a turmoil that a young man goes through in identifying difference between illusion & reality amongst several other interesting things. I always had passion for arts but input from Director certainly triggered that inner thirst to do a movie that takes people to a different world altogether, make them use their intellectual insight and immerse them with a unique experience. “quotes Bhat. Focused on the making a movie that appeals to intellectuals, international accolades were never part of the plan, admits Bhat. After the tremendous success of his maiden venture, Bhat is all set for his next, “Subhashini” directed by Katte Ramachandra for which shooting is scheduled to begin in April, 2018. Gajanan Bhat is a Strategic Advisor & Angel Investor based in Silicon Valley, California. He is currently Founder and CEO of Claridyne, Inc. and Co-Founder & Partner at ArtBandhu, a global AI/ML enabled eCommerce platform for artist community. He is also a Life Member at Keiretsu Forum and an initial investor as well as a Senior Advisor at Keiretsu Capital Venture Fund, LLC. Bhat also serves on the local California Board of US Selective Service System (SSS), appointed by President of United States. With a MS in Physics, Bhat has authored & published several books on international markets. Bhat says the climax of Mojo appealed to him the most and I concur. Slightly over dramatized in parts, the narrative never loses focus on its subject matter. Refreshing narrative, nuanced performances and refined characterizations are the Mojo of Mojo. If subconscious sagas are your beckoning, this mind maze won’t disappoint you. This is a very good article on film Mojo and it is a fair review. The movie is really good and I watched it twice and I would watch it again and again. Good luck to Gajanan for the future projects. Hope he gives us more of the good movies like Mojo!